If you are in tourism, crises from external events are increasingly affecting your business. The connected world that greatly extends your market reach today also brought to your door step the effects of remote crises which only a generation ago had a lesser impact across continents between tourist destinations and originating markets. Unlike natural disasters, such as earthquakes or tsunami, virtually all other crises have social or political roots, however remote the connection may seem to be. For example, floods are rarely a purely natural event. More often than not, the cause may be land mismanagement like deforestation, or ineffective flood control compromised by economic or political considerations. Political crises unfolding in or near tourist destinations can have a devastating effect, far beyond the human tragedy that is often the immediate result. The repercussions of these events affect many people and organisations, from the innocent holidaymaker to local political bodies and tourism organisations. They may ruin industries, cities, even countries. So learning to manage them and their after-effects is vital. While there are several studies of tourism crises caused by terrorism and natural disasters, few in-depth studies have explored the impact on the tourism industry of political crises in general. 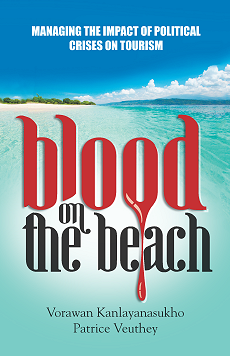 “Blood on the Beach” is a how-to handbook to apply crisis management to political crises and provides a framework for political crisis responses and practical solutions for the tourism industry. The title of the book reflects the impact of political crises upon tourism as it happened after the terrorist attack on the beach of Sousse, Tunisia in 2015, because of its significance for the tourism industry at large: it was more than a destination being affected, it was the product itself - the beach – that became affected. Then the Brussels lockdown following the November 2015 terror attack in Paris transformed a destination crisis event into a product crisis now affecting all major cities. When, a few days later, the US State Department issued a worldwide travel alert, tourism stakeholders face the broadest threat to the industry since the last world war as its two key products, beaches and major cities, became affected globally by current events. 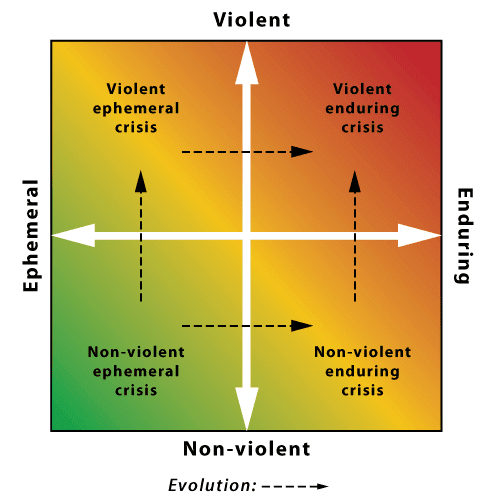 The framework of political crisis responses that is the foundation of this handbook is built from the a classification model of political crisis situations that can usually be assessed in terms of the degree of violence involved and their duration, as expressed in this figure. The first dimension is the degree of violence, which ranges from non-violent to violent. The second dimension is the duration of the crisis, which ranges from ephemeral to enduring, where ephemeral may span from a few hours to a few days and enduring from several days to months or even years. 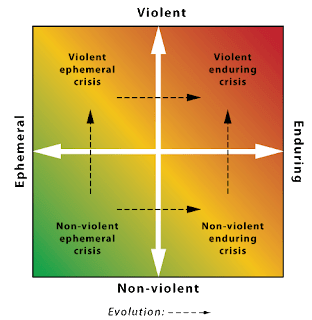 From these two dimensions, political crises can then be divided into four main types: (1) violent enduring crises, (2) violent ephemeral crises, (3) non-violent enduring crises, and (4) nonviolent ephemeral crises. Why is tourism increasingly affected by political crises? In the span of a mere generation, tourism has become a significant industry for many areas that were previously the destination of choice for only adventure tourists or backpackers. Local and international entrepreneurs and organizations have since seized upon the changing tourist landscape to build infrastructure that includes hotel and restaurant chains, transportation services, amenities and attractions. Directly employing hundreds if not thousands locally, many more are employed in the far-extending supply chain. Simultaneously, tourism investments have grown in the generating markets to match these opportunities whether through airliner purchases or extensive marketing. In the span of this same generation, the world has witnessed traditional media and telecommunications evolve into a global medium where people feed, relay and consume news nearly instantaneously. Whereas traditional media reported, summarized and editorialized to an unknowing audience, the “news” element is already in the public knowledge thanks to social media and instant telecommunications today. Details and in-depth reporting is often too late to influence the already formed opinions drawn from 140 character tweets and smartphone pictures posted on Instagram during the course of a crisis. The greatest damage to a destination occurs immediately… as the worldwide audience is watching it unfold live. While the effects may be felt days or weeks later, the damage has already been done. Crisis management serves as a crucial emergency centre during these times, but a plan must be in place first in order to be effective when and if needed. In this way, crisis management acts similar to an insurance policy for events that hopefully will never take place. Large companies including most airlines have dedicated crisis management teams; however, it is neither practical nor cost-effective for smaller organisations to maintain staff specifically for the task. Fortunately, the most important element of any crisis management strategy is… communication, which a stakeholder of any size can leverage. While instant communications like tweets and Instagram pictures so quickly shape public opinion as crises develop, the same avenues of communication are also the most effective means for tourism stakeholders to enter the conversation and manage the effects as soon as possible. 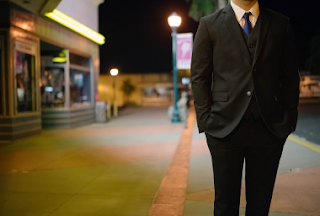 In practical terms… all stakeholders must have the following: a detailed crisis contingency plan, a resource guide for employees, and the ability to delegate decision-making and communications to those best suited to respond during a crisis event. Odds are slim that the person leading a crisis management effort will be easily accessible at the most critical of times, therefore the chosen resource guide book for employees should be both effective and adaptive in ensuring that best practices prevail. The guide should offer concise and adaptable instructions so that no employee is caught desperately searching a lengthy index to find a simple answer. As American English is the most widely understood language by the global audience, consider using it as the language of choice. The next step is to select, build and train a crisis team. Keep in mind that most experienced and senior staff may not be on site, or they may remain unreachable far into an unfolding crisis. Therefore, the best candidates for a local team should be those already adept at utilizing social media. Regardless of their work experience or placement, they should be motivated team players who can be trusted with important responsibilities. Of course, they should be able to communicate in basic English; additional they will require some training in crisis management to ensure that order, not mayhem, prevails. Instead of an arduously written, lengthy, post-event press release… that is often viewed skeptically, build a crisis response plan which serves as a foundation to mitigate negative effects and build credibility in this age of powerful and immediately information. Digestible and accurate communications from coordinated sources distributed throughout the course of a crisis are the key to successfully mitigating their consequences. Vorawan & Associates is a consultancy particularly well learned on the subject of political crisis management for the tourism industry. Do not hesitate to contact us with your questions or inquiries. Welcome to my new endeavor! After four gruelling years of researching and writing my doctoral dissertation, I did it! The proof lay before me as I glance at the nicely bound green book with gold lettering that reads, Development of a Framework of Political Crisis Responses for the Tourism Industry. While it’s an attractive keepsake to be sure, the best reward of this intensive process still awaits. It is my intent that this new blog bridges the gap between the academic theory of travel and tourism and my real-world experiences in the field. 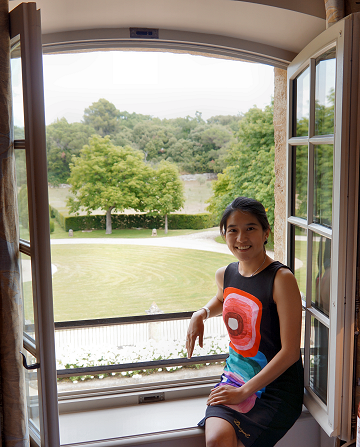 Who we are – Vorawan & Associates Ltd. was founded by me in the aftermath of my doctoral degree. It seemed only natural to create a consultancy which, like my own background, draws upon the unique knowledge and resources of both the academic and business worlds to better serve clients. V&A Ltd. is based in London and offers tourism crisis management consulting services to a range of private organizations, NGOs and government agencies. Additionally, we participate in conferences and publish industry papers and books on the subject. 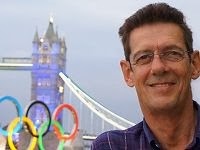 While I leverage my knowledge of the effects of political crises on tourism, it is the “associates” element of this consultancy that is crucial to developing a unique, valued and credible reputation by serving clients who face increasingly complex issues. These associates will continuously evolve to include academics and industry executives alike who possess broad knowledge and experience that can be applied to tourism, politics and crisis management. What to expect - Expect to find V&A Ltd.’s published papers, conference schedules and associates’ biographies on our new website, Vorawan.com. This blog will offer a mix of trim academically-oriented short papers and current event analysis alongside trade-oriented briefs devoted to application models and practical suggestions. The blog, like the consultancy itself and my own background, reflects the integral connection between theory and practice to best serve our clients and readers alike. With that, welcome once again to this new endeavour!